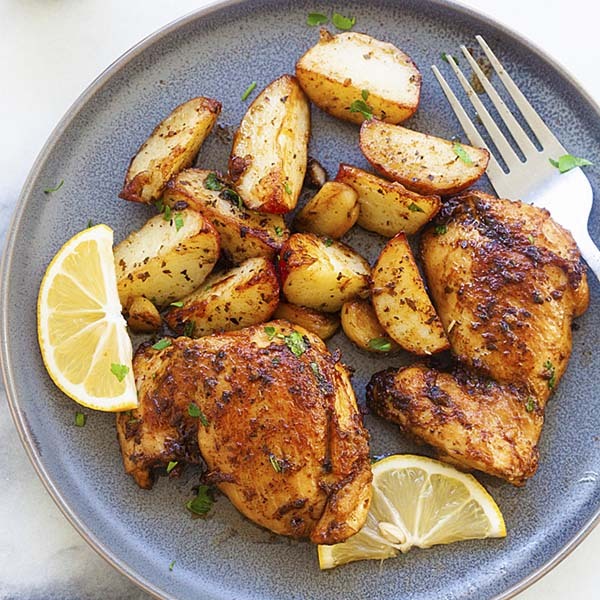 Easy one-skillet chicken and potatoes that takes less than 30 minutes to make. The chicken is so delicious and the tender potatoes complete this family friendly dinner meal. What to Make with Chicken and Potatoes? Chicken and potatoes are two of the most loved ingredients and when you combine them together, they make an amazing meal for dinner. 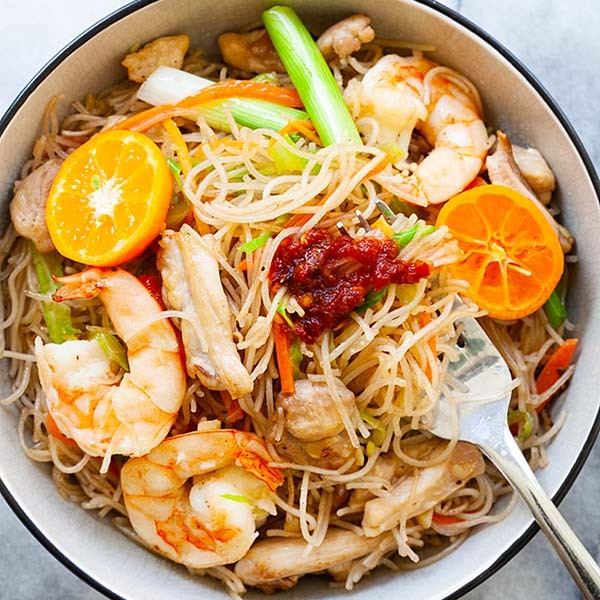 In this recipe, I will teach you how to make the most amazing and mouthwatering one pan recipe that you’ll want to eat every day! I recommend cast-iron skillet for the best results and ease of use. You can cook both ingredients in the same skillet. 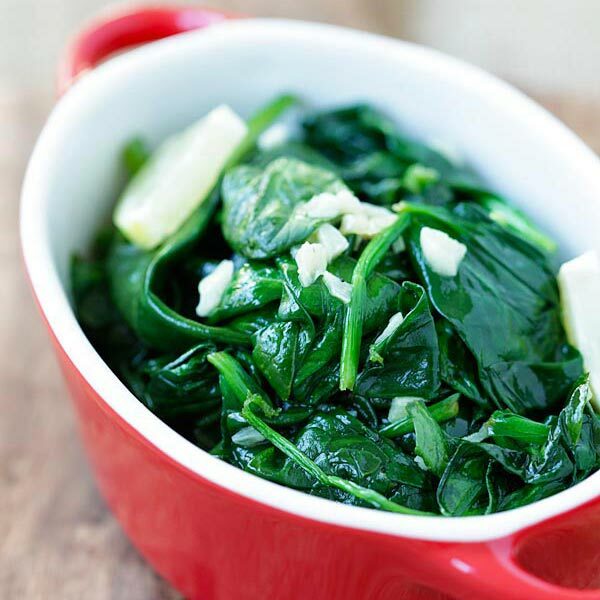 Cast iron skillet retains high heat and spreads heat evenly, which is great for this recipe. You can also use a pan or stainless steel skillet. Tips on How to Cook Chicken and Potatoes? Marinate the chicken with smoked paprika, Italian seasoning, olive oil and salt. 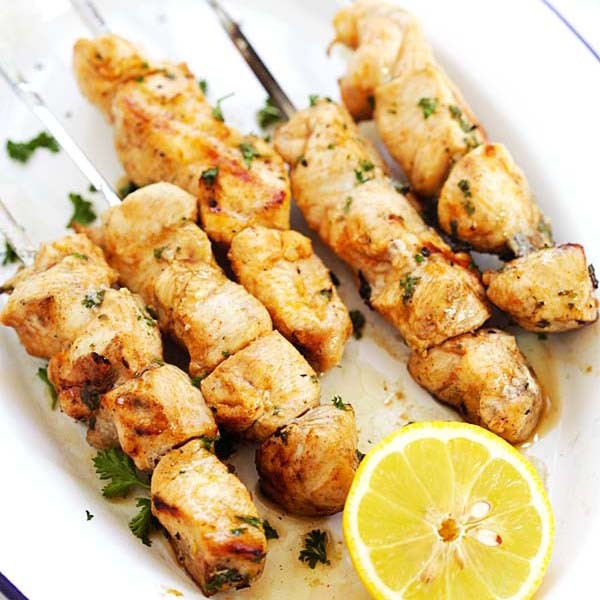 A well marinated chicken will ensure that they turn out juicy, moist and delicious. Slice the potatoes into small wedges so they cook evenly on the stove top. How Many Calories are in Chicken and Potatoes? 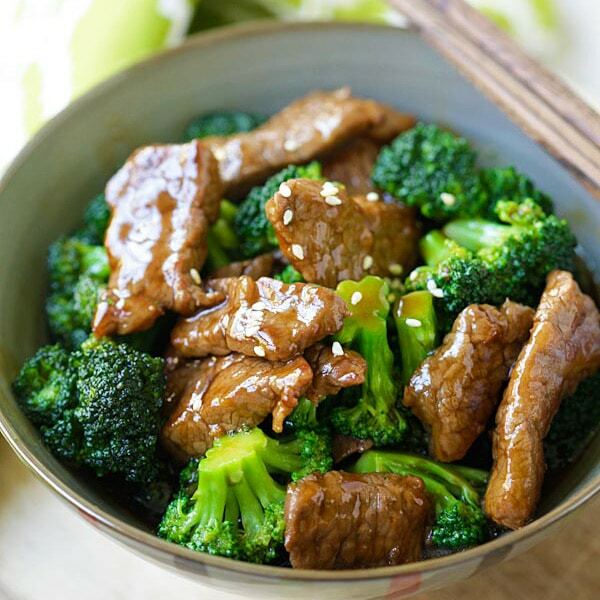 This recipe is healthy with only 350 calories. 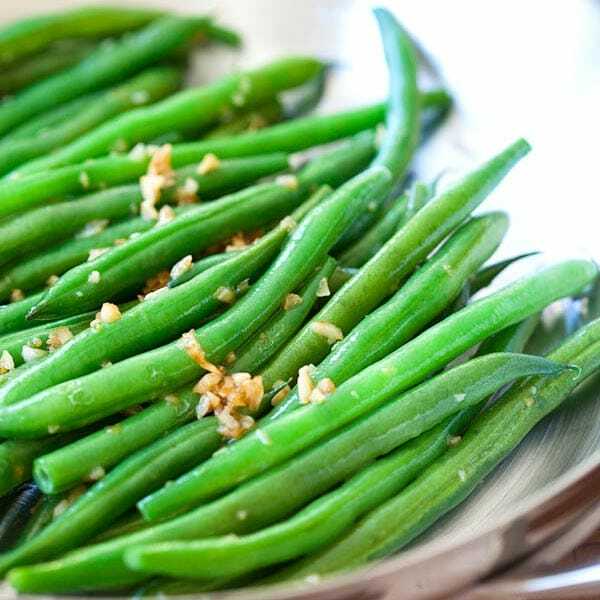 Serve it with a vegetable side such as garlic green beans or sauteed spinach to keep the calories low. 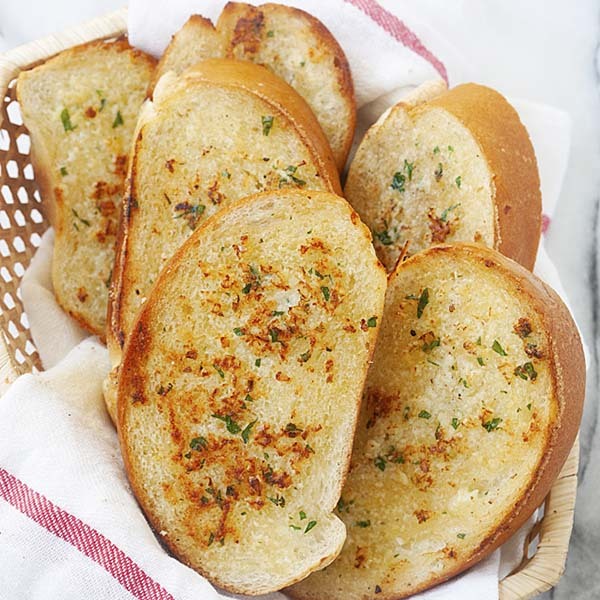 Just look at the pictures, this recipe is epic and will forever change your dinner. The chicken is juicy, moist, extremely flavorful and the potatoes are fork tender. Make this for dinner tonight. Enjoy! 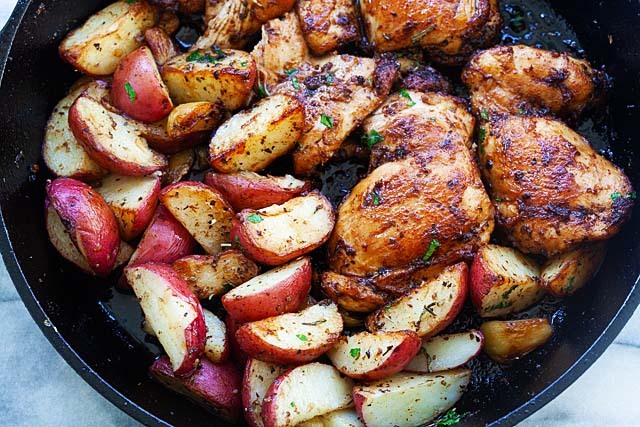 Easy one pan chicken and potatoes that takes less than 30 minutes to make. The chicken is so delicious and the tender potatoes complete this family friendly dinner. 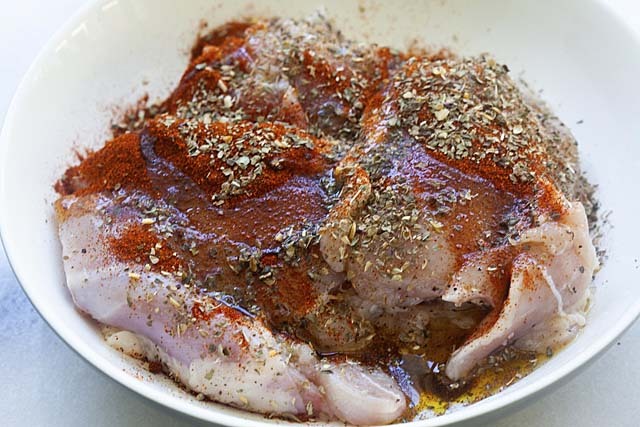 Marinate the chicken with the smoked paprika, Italian seasoning, salt and olive oil. Stir to mix well. Set aside. Heat up a cast-iron skillet on medium-low heat. Add the olive oil and butter, follow by the garlic, potatoes and the rest of the ingredients. Cook the potatoes wedges until the outside is browned and the inside is cooked through, about 10 - 15 minutes. Dish out and set aside. In the same skillet on medium heat, add the olive oil and butter. 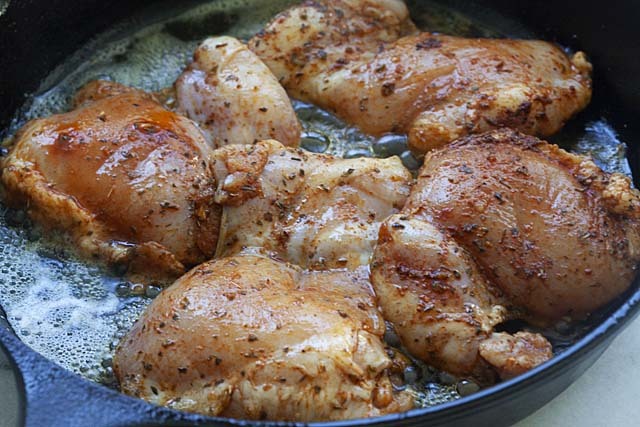 Pan fry the chicken, each side for about 4-5 minutes. Turn over and pan fry the other side. Push the chicken to one side and add the potatoes. Add more salt to taste. Turn off the heat and serve the chicken and potatoes immediately, with a hot sauce of your choice, if you like. 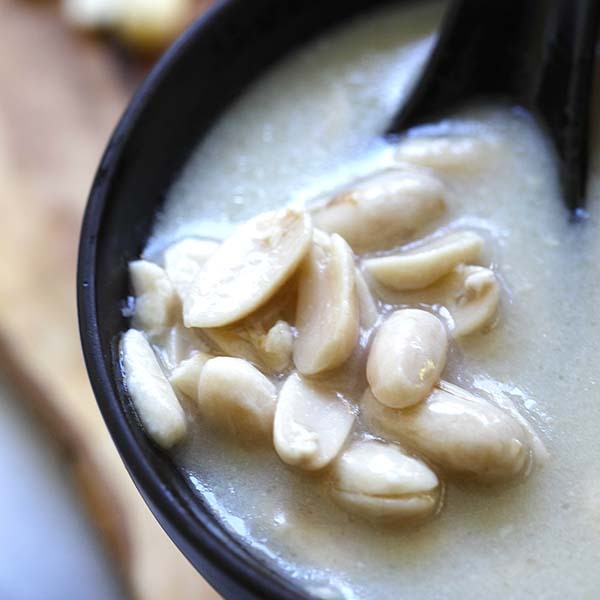 This recipe is inspired by Eatwell101. 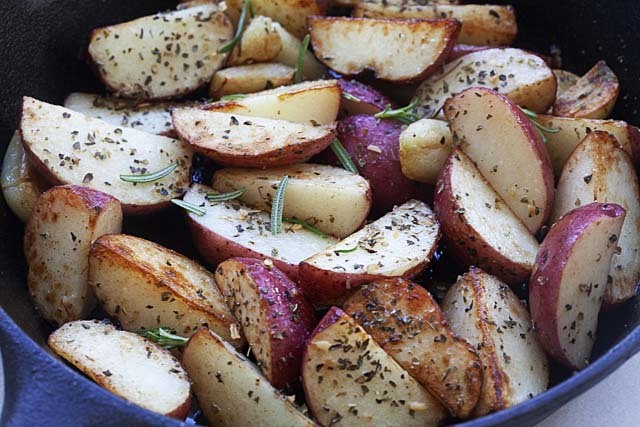 If the potatoes are not tender after cooking on the stove top, you can roast in the oven for 5-10 minutes at 425F. Let me check and fix. That looks amazing – thank you! Oooops thanks for letting me know.